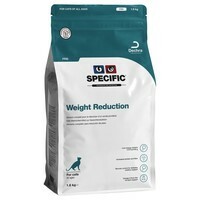 Specific Weight Reduction FRD Dry Food for Adult Cats is a nutritional dietetic pet food perfect for use as part of a weight loss programme for adult cats that need to lose weight. Designed to satisfy your cat’s appetite and leave them feeling full, the diet is high in fibre and protein, yet still low in fat and calories. This allows your cat to be fed a large amount of tasty food, whilst still helping them to lose weight. Maize Protein, Cellulose Powder, Fish Meal, Dried Peas, Wheat, Oats, Minerals (including Tri-Potassium Citrate), Potato Protein, Animal Protein Hydrolysate, Pork Fat, Maize, Vitamins and Trace Elements (including Chelated Trace Elements), Methionine, Ammonium Chloride, Fish Oil, Taurine, L-Carnitine. In comparison with Hills R/D or Royal Canin obesity management my cat finds this food unpalatable and even on a restricted diet will leave it uneaten.